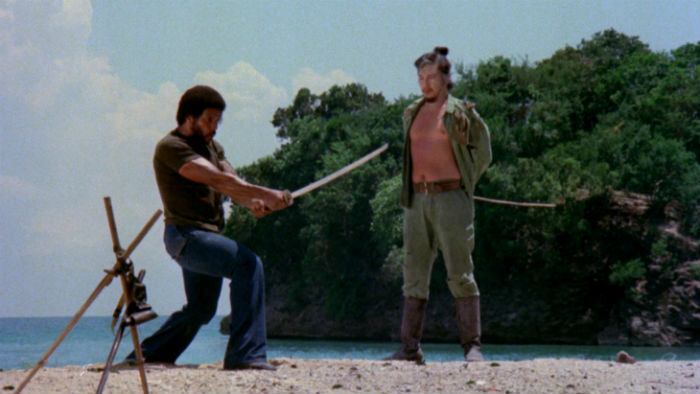 Lost Japanese Soldiers Train A Double Crossed Blaxploitation Hero In 1978’s Death Force – LILY & GENEROSO 4EVER! I don’t know too many men my age that never delved into the occasional Gilligan’s Island episode during their youth for a glimpse of Daisy Dukes wearing Mary Ann. A silly, yet borderline offensive show at times, Gilligan’s Island fit in well with the panorama of inane shows of The Beverly Hillbillies and Green Acres variety that intentionally seemed to have a bare minimum plot so that you could see an Elly May Clampett type parade around scantily-clad group of unwashed yokels to get an instant jolt of middle class superiority. There was perhaps one positive benefit from my years of watching the seven castaways fumble around the island trying to make batteries out of coconuts, and that came from of a 1965 episode entitled, “Sorry, My Island Now,” in which a lost “Japanese” sailor, ( “Japanese” because the sailor was played by Neapolitan actor, Vito Scotti) complete with super thick Mickey Rooney Breakfast At Tiffany’s-styled Asian glasses, holds the gang hostage as he is under the belief that World War Two was still an ongoing conflict in 1965. The episode is a morass of terrible racial stereotypes that were common for the time, so it is not worth hunting down, but the positive that emerged was that twelve year old me wondered if such a thing had ever occurred, and I subsequently made my way to the main library to find out, and the truth was a tough one to swallow. The “holdouts” as they would come to be known, were Japanese soldiers who had served in the Pacific Theater who were either stationed in remote islands or cut off from official communications, and as a result, they simply didn’t know that the war was over. Or, they were dogmatic fighters who refused to believe that the war was over, even though they had heard communications of the fact but yet held firm their military appointments without conflict or found another fight somewhere else and pretended that World War Two was still happening. What boggled my mind was that some of these “holdouts” held on until the early 1990s! The last of these men, Shigeyuki Hashimoto and Kiyoaki Tanaka, returned to Japan from Malaysia. After the Japanese surrender, they joined with the Communist Party of Malaysia guerrilla forces to continue fighting against the British, only returning after the CPM laid down its arms and signed a peace treaty. The story of the “holdouts” was not wildly reported on in Philadelphia, where I was an adolescent in the 1970s, but I imagine that this was commonly known in Manila, the hometown of Death Force director, Cirio H. Santiago. I often refer to director Santiago as the “Roger Corman Of The Philippines” as the producer/director was not only a pioneer of blaxploitation films like 1974’s TNT Jackson and 1976’s She Devils In Chains but also a production platform that helped launch the careers of Jonathan Demme, Joe Dante, and Carl Franklin. He can film action, and in the case of Death Force, he can, along with screenwriter, Howard Cohen, come up with some rich characters and dialog that is at times, dare I say, touching. Death Force begins with three American Vietnam Veterans, Doug Russell (James Iglehart, the hunky weightlifter from Russ Meyer’s Beyond The Valley Of The Dolls), Morelli (Carmen Argenziano), and McGee (played by a pre-Penitentiary Leon Issac Kennedy), who have just stolen a ton of gold from Santiago’s native Philippines. Doug just wants his cut so that he could reunite with his gorgeous wife, Maria, and who could blame him as she is played by Jayne Kennedy, fresh from her appearance at the Miss USA Pageant, but Morelli and McGee want to take their cut back to Los Angeles and become ruthless crime kingpins, which suits Doug fine, so they board a boat with their new found riches and head for home. But boys will be boys, and McGee and Morelli, like five year old kids on Christmas Eve, cannot be patient and start their Michael Corleone fantasy trip on the boat as they cut poor Doug’s throat and toss him overboard so that the greedy jerks can keep his cut too. Michael Corleone at least waited until Fredo screwed him over before having him plugged on a fishing boat. Get with the program boys! What occurs next is what you would expect from a mid-1970s blaxpolitation film in terms of violence, but the pacing of the film becomes another positive aspect of the narrative. This could easily go down after the island scenes as a quick bang-bang revenge film, which was so prevalent in the post-Death Wish era, but Santiago allows the characters whom Doug meets to develop along with the plot, and you start to develop genuine empathy for not only our main protagonist but also those who aid him on his quest to find honor, where honor has been removed from his life. There are no quick solutions and as the film veers towards an ending, you have some much needed space between the beheadings (yes, there are a bunch) to feel the stories of all involved. Though not as tightly put together as Mike Hodges’ masterfully crafted 1971 British gangster revenge film, Get Carter, Death Force does remain true to Doug, our hero, as Hodges’ film does to Jack Carter. Death Force is an impressive feat for a low budget film shot in the Philippines, which at the time was a breeding ground for many a schlockfest, which were quickly done to get the most bang for your dollar. Death Force is not Melville’s Le Samourai, but it does wisely incorporate the code of the Bushido, allowing that doctrine to energize the story and provide a interesting motivation, past simple revenge, for its main character which is more than I can say for any Hollywood production of its time. One can only credit the influence of Bruce Lee and the proliferation of martial arts films in the West during the 1970s for the change in the stereotypical depiction of Asians in films here in Hollywood. Sadly, this didn’t last long as the 1980s brought in an entirely new middle class generation that needed to pray on these outdated Asian stereotypes with characters like Long Duk Dong in Sixteen Candles and Ben Jabituya in Short Circuit. After John Woo and the bullet throwing Hong Kong action films of the 1990s, there was a brief reprieve from the thick glasses and funny English found in the Asian characters of 80s films, but here it is, 2016, and we have Fresh Off The Boat and Outsourced. I guess the only thing that Hollywood can ever respect from the East, is when they can depict violence like the West.